Hello from our new Dell Vostro 1500 laptop! We just got this laptop for my wife to use at home, but I thought I should spend a few minutes getting everything up and working (and blog about it). Generally speaking, I'm a Mac guy, but this laptop is pretty sweet and the price was right. We got it for just under $800 including shipping and taxes. At the moment, Dell is offering a $300+ instant rebate that we took advantage of. The laptop we chose is basically right off the shelf with a few minor tweaks that ended up costing us less than $200. Our system comes with 2GB of RAM and a 120GB hard drive. We left the RAM the same, but exchanged the stock 5400 RPM drive with a 7200 RPM model. Drive speed is more important than people imagine, especially if you are doing a lot of disk work such as image editing or playing video games which load extensive maps, etc. 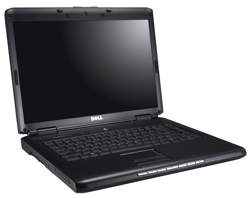 The processor is the default Intel Core 2 Duo T5270 which runs at 1.4GHz. The front-side bus is 800 MHz and it has a 2MB L2 cache. We could have gone all the way up to 2.4GHz and 4MB L2 cache (Intel Core 2 Duo T7700), but that would have added $575. The final upgrade we made was the video card. The default video card is the NVIDIA GeForce 8400M GS which has 128MB of RAM. We spent $100 extra to get a NVIDIA GeForce 8600M GT with 256MB of RAM. It's important to note that these video cards do not used shared memory. When I was originally looking at other laptops, I found that even when a video card was advertised as 256MB, it was often sharing system memory. The lesson to be learned here is that you really need to research what you're getting and make sure it checks out. In fact, a nice website for doing just that is Notebookcheck. One final note on the video card: without any tweaking I was able to run World of Warcraft at 1280x800 resolution and get 60 FPS. That's all the interesting details that come to mind. If you have any questions, just let me know. Great blog. Where can I find a free contract Acer notebook deal with a mobile bradband dongle?